ANDRIY.CO - Treatment of clothing and footwear in TCU2. Dimensions. Treatment of clothing and footwear in TCU2. Dimensions. 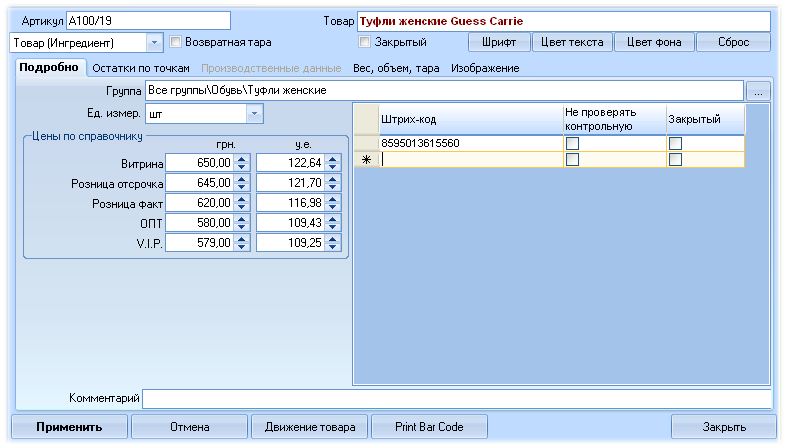 Start TTSU2, go to the desired point, and trading in section «Enter new» press icon «receipt invoice». 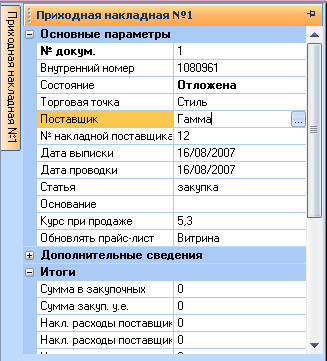 A form of income bill, on the left side of the sidebar include the following data: set the invoice number, date, write your article and begin the movement to bring the goods. Please note, we introduce the name of the product (shoes, women's), introduced a model (Guess Carrie), product, product group (subgroup of «Women's Shoes» in the «shoes»), bar code, but the amount is not entered. Push the button «Apply», and return to credit invoice. Add our products in the consignment note, using bar-code scanner, or the tool of choice of goods. What we said this line? The most common standard set: the goods, quantity, procurement and retail price. Estimated margin. But information on the amounts lost. We do not know what the size of a given record, does not know about it and TCU2. 1. 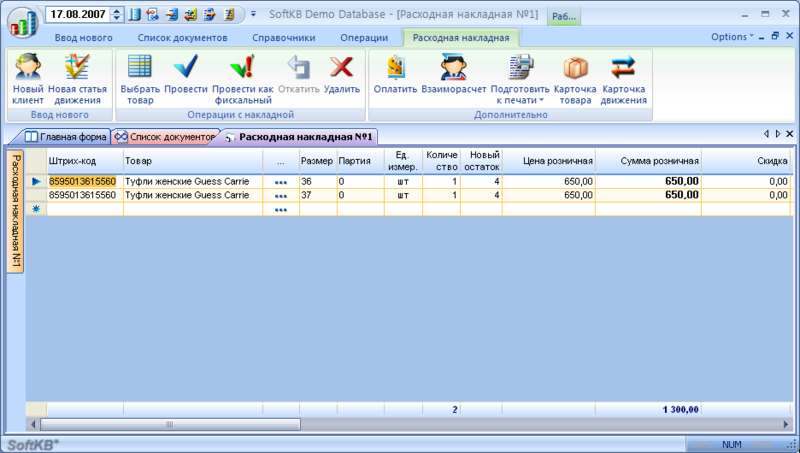 Go to System Settings in the section «Setting up a warehouse model». 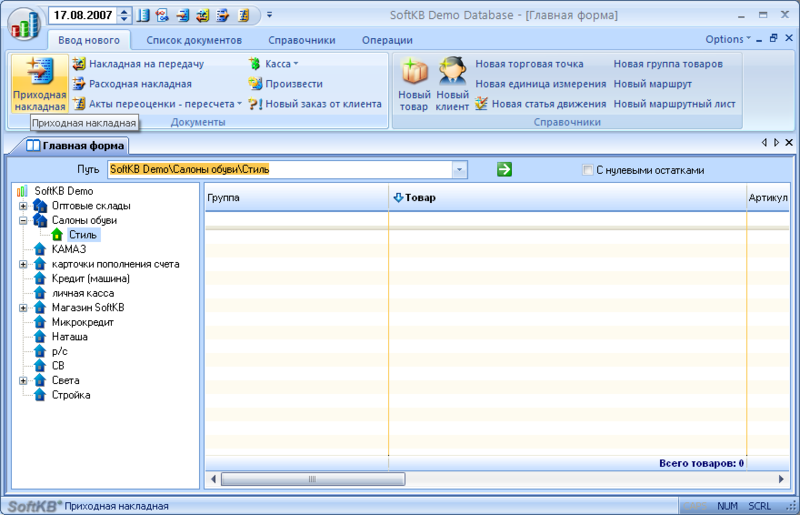 engage the first parameter group, click the box «Group», and enter the name of a field group ( «Size»). Value «You can change in the transmission» can not be utilized as the feature «Size» for the product throughout its existence, always. Click "Apply" and return to the credit invoice. Please note, the bill has a new column «size». For convenience, drag the column size of the place, reaching for the commodity. now introduce our products in the consignment note with the size. Our 20 pairs are now established as the 4 positions, each contains 5 pairs of his size. We will credit bill and proceed to the main form. We will look at it and a register of goods in the main form. As we can see, the product of different sizes are not mixed, the account of each size is shown separately, the number of dimensions can be controlled by the minimum number to order different sizes in supplier as a separate product. That is not the only option of products with different sizes. If the same product with different size of bar-coded in a different, easier, and introduce it as a different product with a different name, but in the name of a different size. If the sale is executed by the bar code, in this case to avoid errors for each size of your own bar-coding.